This post by Jackie Bigford appeared first socialnotz. Some days we all need a little motivation or pick me up and everybody loves a good quote! Just do a Google Search for ‘quotes’ and you will pull up over 570 million searches. In an increasingly visual society, it is an art form to produce quality visual quotes. Just visit Pinterest and your search will bring up hundreds if not thousands of quotes in almost any subject you can think of. We decided to have some fun with the members of our Facebook and Google Plus communities. Every Monday we do a post to celebrate #MotivationalMonday and we asked our fans to post their favourite quotes. The response was excellent! We then asked our fans to vote for their top quote. The top five winners are featured below. 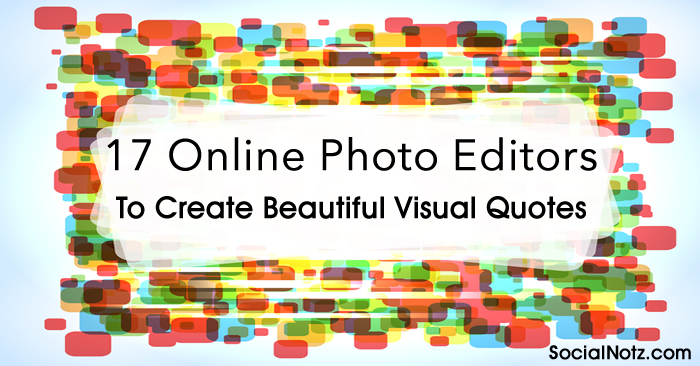 Rather than just post the words, I thought that I would also feature some of the best apps and online photo editing sites to create visually stunning image quotes. Not everyone is proficient in Photoshop but the photo editors below can assist you to create quality images with ease and speed. Posted below are the winning quotes ranking from number one to five. For those that like the bold white text on a plain background “Quotes Cover”delivers in spades. It is free and it is simple and quick and you can create your graphic to conform to size requirements for Facebook, Pinterest and Google+. Pic Monkey is by far one of my go-to sites. It is so versatile and offers so many options…..backgrounds, large selection of fonts, add filters, frames, and effects and it is free. I personally have the paid version as it adds many more features but for simply creating visual quotes the free version will be all that you will need. Online Image Editor has a great toolbar for super easy editing . This took literally a couple of minutes to complete. Pinstamatic is a super site for anyone who loves to post to Pinterest. Quotes and Text – Choose a style by clicking on one of the icons, then add some text. If you are preparing a quote, supply the author too. Website Snapshot – Enter the URL of a website in the box provided and Pinstamatic will take a snapshot of the website. Spotify Track – Create a pin of a favorite song and its album artwork. Twitter Profiles -Add a pin of your Twitter profile or that of one of your friends. There are several other great features that you should check out. Chisel offers hundreds of images to choose from directly on their site and you simply add your text…so quick, easy and free. You do have to create an account with them, but is takes a couple of minutes.